Jig Saw. Have a relatively easy jigsaw. Before the study, write on the back : “The new is in the old concealed; the old is in the new revealed”. Do the jig-saw on a piece of card. When the puzzle is finished, put another piece of card on top, and turn the whole thing over. The read the message. 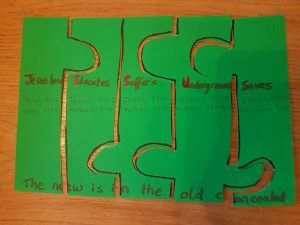 By putting together the puzzle, the message is revealed. In the same way, we need to put the messages of the old testament together to reveal Jesus. This week, we do the craft and th study together. 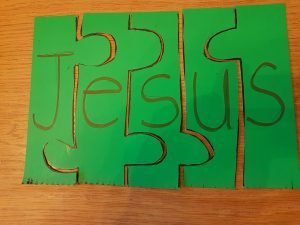 Have a piece of card with 5 jigsaw pieces drawn on them with the letters JESUS on it. Get the children to cut out the puzzle. On the back, we take each letter and see a message. First of all, write on the bottom, ‘The new is in the old concelaed’. Then go through the pairs of verses explaining how the old reveals the new. J is for Jesus is born. In Isaiah we read this in Isaiah 7v14. In the new we read the message of ‘God with us’ in Matthew 1 v 22. Matthew 4v13-16: Same verses. Emphasise that they are the same words, the old prophesying the new. Isaiah 53v4 : He bore the pain and suffering for us. Isaiah 53v11 : He will save (justify) many and will bear their sins. It is tempting to make this week’s sunday school class too detailed, so try to keep this as simple as you can so that the children can understand it.